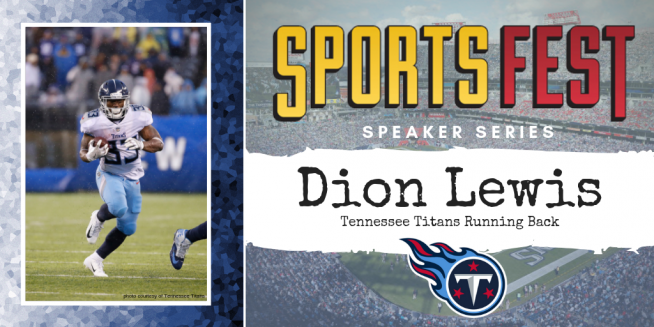 104-5 The Zone is excited to have Tennessee Titans Running Back Dion Lewis as a guest speaker at the 10th annual SportsFest at Nissan Stadium on Saturday, March 30th! Dion Lewis is entering his second season with the Titans. Early in the 2018 offseason, Titans signed unrestricted free agent, Lewis. Lewis was a fifth-round draft choice in the 2011 NFL Draft by the Philadelphia Eagles. Lewis spent his first two professional seasons with the Eagles before stops with the Cleveland Browns, Indianapolis Colts and New England Patriots. Lewis had 16 carries for 75 rushing yards and a rushing touchdown with five receptions for 35 yards in his Titans’ debut in the 2018 season opener against the Miami Dolphins. In Week 7 vs the Los Angeles Chargers in London, Lewis ran the ball 13 times for 91 yards. Lewis finished the 2018 season with 517 rushing yards on 155 attempts and 400 receiving yards on 59 receptions. With the Patriots, Lewis won Super Bowl LI over the Atlanta Falcons in 2017. Before the NFL, Lewis played two college football seasons at Pittsburgh, where he finished fourth on the school’s all-time rushing list with 2,860 yards (via Titans).